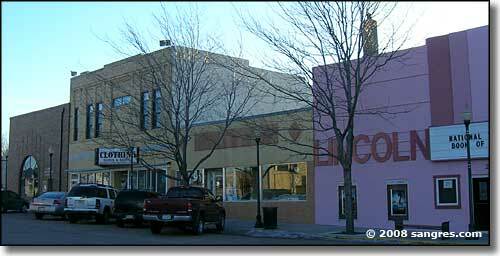 Limon is located on the eastern plains of Colorado, at the point where US 24, US 40 & US 287, plus Colorado 71 & 86, all intersect with the I-70. Of course, when folks first started to congregate in Limon there was probably only a railroad siding and water tower here (the Rock Island and Union Pacific depot wasn't built until 1910), none of these highways yet being even part of a twinkle in the eyes of the grandparents of the engineers who finally designed and built the roads. All this convergence of long distance asphalt and steel ribbons has led to Limon being called the "Hub City" of eastern Colorado. This is cattle country: on the way into town I passed a processing plant for Coleman Natural Beef (no steroids, no antibiotics, no genetic "enhancements", etc.) The Coleman plant was immediately upwind of the Limon Correctional Facility, part of the Colorado Department of Corrections system and a major employer in the area (roughly 350 jobs). There's also a lot of wheat grown around here, but any sizable bit of dirt that isn't flat enough for wheat production probably has cattle on it. The main business district in town is on a street perpendicular to the route taken by most of the thru-traffic. At the end of that street (100 Civic Center, to be exact), is a very distinctive Town Hall. 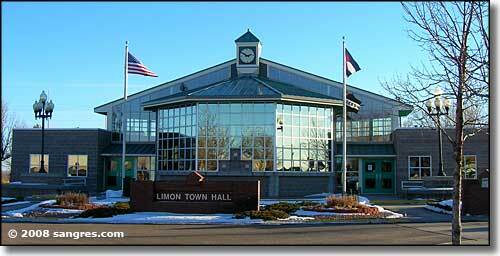 The rest of Limon didn't look very old but that Town Hall was a pleasant surprise, especially after some of what I've seen in most of the older towns I've been through on these same eastern plains of Colorado. The Medical Center was about a block east of Town Hall with the Limon Heritage Museum another block to the east but across the street, above the railroad tracks. Most tourists, though, probably would never have to leave that main route through town to find everything they might need in Limon. Too bad, the local folks I met were very friendly and helpful, the Heritage Museum Complex is well recommended (very nice "Trains on the Plains" exhibit and the Houtz Native American Collection was excellent)... but there's not an awful lot out of other draw out there in all that "flat" land. I left town headed southwest on US 24 (headed for Colorado Springs), and was back in sight of snow-capped mountains in a matter of minutes.